Members of the Republican Study Committee are putting forward their own piece of legislation for health care reform, a summary of which was provided exclusively to CBSNews.com's Washington Unplugged. While Democrats are focusing on creating something like a government-sponsored health insurance plan and regulating the health insurance market, the Republican "Empowering Patients First Act," which Rep. Tom Price (R-Ga.) will introduce tomorrow, instead promotes the individual insurance market as well as employer-based markets. Instead of focusing on regulating private insurers, the plan would in fact give them more freedom to work across state lines. Republicans say the plan will be paid for by reforms of defensive medicine, creating a more efficient health care system, and overall reductions in non-defense government spending. "Liability reform has to be one or the hallmarks of a bill," Price told CBS News investigative correspondent Sharyl Attkisson today on Washington Unplugged. "We make certain we pay for our bill by making this a priority." According to the summary, the bill aims to make health care accessible to all Americans by creating tax incentives for consumers to purchase insurance on the individual market, encouraging states to assist consumers with pre-existing conditions, and promoting the employer-based insurance system that is popular with many Americans. 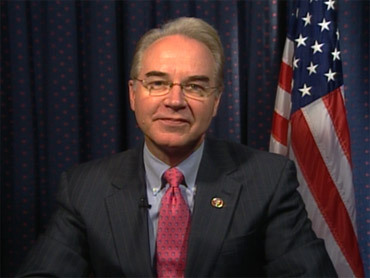 "It's imperative each and every American have the access to health coverage that they select," Price said. "The way you do that is through the tax code to make it financially feasible." The Republican proposal would extend the income tax deduction on health care premiums to those who purchase coverage in the individual market. By contrast, several others -- ranging from Republican Sen. John McCain to Democratic Sen. Ron Wyden-- have proposed eliminating the deductions all together; that idea, however, has remained unpopular. In the Republican plan, low-income consumers would also be eligible for advanceable, refundable tax credits, provided on a sliding scale, to purchase coverage in the individual market. In order to provide coverage for Americans who have pre-existing conditions, the Republican plan proposes giving states incentives, such as federal block grants, to establish high-risk insurance pools. Comparatively, Democrats have proposed regulating insurance companies to prohibit them from denying coverage to people with pre-existing conditions. To promote the employer-based health insurance system, the Republican plan proposes giving small businesses tax incentives for auto-enrolling employees in a plan. Many companies already auto-enroll their employees. The plan also calls for allowing workers to define their own contributions to an employer-sponsored plan. Employers would als be encouraged to offer discounts for healthy habits through wellness and prevention programs. Republicans are also proposing to expand the individual market by creating pooling mechanisms such as association health plans and individual membership accounts. Consumers would also be able to shop for insurance across state lines. They would be able to obtain more information about different plans through state-based health plan portals the Republican plan proposes creating. However, the portals would simply provide information, unlike the Democrats' proposed health insurance exchange, which would be a marketplace for comparison shopping. The Republican plan also proposes reforming Medicaid and the State Children's Health Insurance Program (SCHIP) by giving beneficiaries the option of getting a voucher to purchase private insurance. Mr. Obama, in fact, wants to lessen encouragement for private insurer participation in government-run programs like Medicaid and Medicare -- he has proposed eliminating subsidies for private insurers to participate in Medicare Advantage. The Republican plan also reforms Medicaid by dictating that states must cover 90 percent of those below 200 percent of the federal poverty level before they can expand eligibility levels under Medicaid and SCHIP. Republicans and Democrats agree the Sustainable Growth Rate (SGR), a formula Congress created to keep Medicare costs under control, needs to be reformed. Without reform, doctors could face a pay cut in Medicare reimbursements of about 20 percent. The Republican plan would rebase the SGR and create two separate conversion factors for primary care and all other services. Republican and Democratic ideas about health care reform perhaps differ most substantially on the issue of cost containment. Most of the reforms proposed in the bill, the summary says, would be paid for by decreasing defensive medicine; savings from health care efficiencies; reducing waste, fraud and abuse; and an annual one-percent non-defense discretionary spending step down. The plan touches on Mr. Obama's proposal to further implement comparative effectiveness research (CER) as a means of reducing waste, which is very controversial. CER attempts to use research and scientific evidence to conclude which health care treatments are most cost effective. The president already instituted the idea through the the stimulus package, which created the Federal Coordinating Council for Comparative Effectiveness Research to coordinate CER across the federal government. The Republican health care proposal would require that none of the suggestions from the Council for Comparative Effectiveness Research be finalized unless done in consultation with and approved by medical specialty societies. It would also establish performance-based quality measures endorsed by the Physician Consortium for Performance Improvement (PCPI) and physician specialty organizations. The Republican plan also addresses the issue of medical liabilities that doctors face -- something Democrats have not addressed. It would establish in each state administrative health care tribunals, also known as health courts, and add affirmative defense through provider established best practice measures. It would encourage the speedy resolution of claims and caps non-economic damages. Price said today on Washington Unplugged that the August recess will give Americans the chance to compare and contrast Republican and Democratic plans. "If we go home over August and talk to the patients of America, we wil have a better product in the fall," he said. "The American people will select solutions that will put them in charge," not the government. Click here to watch today's full episode of Washington Unplugged.